Since launching in Germany in 2005, RaceBets have been growing into one of the top horse racing bookies in the world, and these days they can offer meetings from 40 different countries to UK customers. The scope of their coverage is pretty much unrivalled in the industry, so horse betting fans will struggle to find anywhere that suits their needs better. 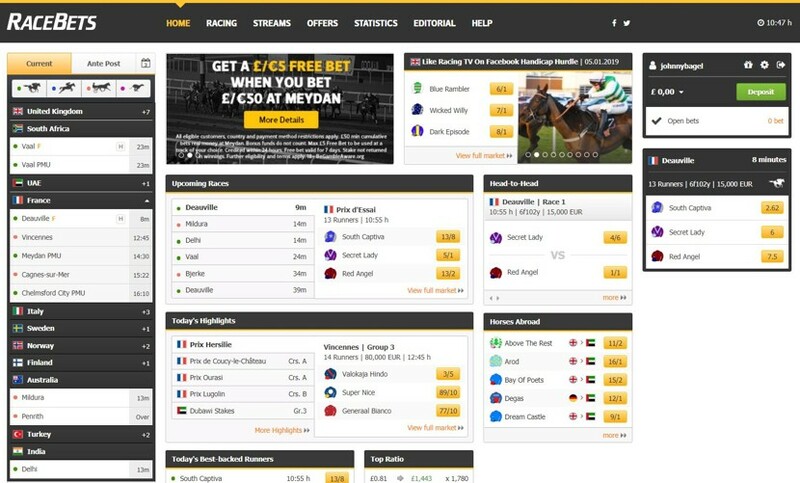 RaceBets sweeten the deal with a plethora of offers and features to aid decision making and enhance value, although the website could do with a spring clean in places. Their mobile offering, on the other hand, is first class, and although things can be a little overwhelming for newbie’s, there is plenty of help and advice on hand in the Knowledge Base and Editorial. As the name implies, RaceBets have one focus and that is horse racing, and they cover it globally. You will find non-UK meetings at this bookie that literally no one else in the country will have prices on. Gallops, Jumps, and Trots are all available to bet on, and the Greyhounds are tagged on as well with full market coverage. There are over 250,000 races to wager on each year. Evidently then, sports fans should look elsewhere. But even if you only occasionally bet on the horses, note that their single sport focus means that all of their offers and promotions are geared towards the races – so where most bookies may have a handful of horse racing promotions, RaceBets have nothing but. First past the post and fence fallers promotions have been available in the past, while Bash the Bookie (behave), Pick 6, and the Betting Pool are just three of the other features worth looking into. Another jewel in the crown of RaceBets is that best odds guaranteed is available not only on all UK and Irish horse races, but also on all UAE and South African meetings too. The odds tend to be pretty good anyway where the horses are concerned, but this just gives you less to worry about when weighing up your options. It’s worth playing with the settings too as not only can you change odds from decimal to fraction, but you can choose the metric or imperial system for weights and distances too, as well as playing with preferred stakes and a few other bits. Lot’s of nice extras touches. Live betting on horse races isn’t actually something that every bookie allows. RaceBets isn’t among them. Here, punters can bet after the race has begun to try and get an edge, although of course, the odds will reflect the situation as it unfolds. Live streaming is not only available, but it is free to watch too, so you don’t have to place a bet on the race to stream it. This is almost unheard of and a very generous touch from RaceBets, it also encourages live betting we should imagine. The cherry on the top is that live streams are available from all over the world not just the UK, and they come thick and fast all day. Hundreds of races are available in any 24-hour period and it’s no exaggeration to say that no other bookie can match RaceBets in this department; it’s probably their number one selling point. Picture quality is good too. Since RaceBets have customers worldwide their list of accepted payment methods is strong. UK customers can use any of the major payment providers and will incur no fee from RaceBets to deposit. Those with larger bankrolls will be happy to know that the below maximum limits are per 24 hours. Withdrawal limits differ depending on the individual and their betting activity, so it’s difficult to pin RaceBets down on this, but in general the minimum withdrawal is £10 and if you try and withdraw less they may charge you £1.50 for the privilege. You can withdraw as many times as you like but a 50p charge will be incurred from the 4th withdrawal onwards in any 30-day period. So, technically there are withdrawal fees, but they seem fair enough to us. RaceBets are certainly not lacking in this department. As well as offering a good number of promotions for new customers and old customers alike, they also run a lot of regular offers. Some which we don’t cover in detail include the daily Login Game, which could see you awarded an unexpected bonus just for turning up; and the daily Jackpot Freeroll, which requires you to pick six winning horses and answer an easy question to win a £5k jackpot. Here, you are essentially competing with RaceBets own experts and the aim is to correctly predict the winner of 6 different races. Points are awarded for every selected runner that finishes within the place terms for that race, and if you have more points than the bookie once the last race is over a bonus is credited to your account. It gets better because there is also a grand prize to be won for the player with the most points overall, so you will also be competing against your fellow punters. Plus, an extra bonus will be granted to the top three scoring players in any given month. You need to have £10 staked in the participating races to join in, but after that it’s all added value and added enjoyment too. The depth of statistics on this site knows no bounds. There are whole websites out there dedicated to this stuff and RaceBets have tied it all into their betting interface. 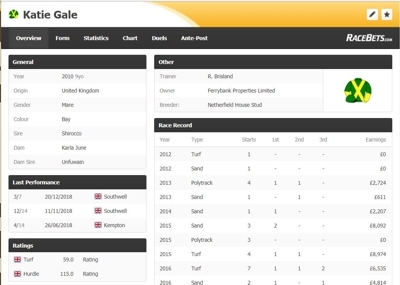 You can search the Stats area for a particular horse (and some of them go back donkey’s years) and even view starts/wins/earnings etc of many jockeys and trainers from different countries. However, comprehensive information is also available from race to race, so you can get all of the data you need on a horse and its rider/owner/trainer from the betting area immediately before you choose whether or not to place the wager. Never has the punter been so well informed. The Editorial offers tips and analysis as well as a blog – although that title doesn’t really do it justice. It’s as good as any racing magazine with interesting articles on everything you can think of added each day. You might be reading this and thinking it all sounds wonderful but they are still without the Tote. Well, this may be true, but since RaceBets are a German born bookie they can offer their own exclusive alternative. The Betting Syndicate Pool offers a better chance of winning for a smaller stake, and what you get out is relative to what you put in. RaceBets own experts will pick their selections before the race starts which punters can back if they choose. If the selections come in your winnings will be paid out relative to the percentage of the pool that you staked; so if you stake £10 of a £100 pool you get 10% of the overall winnings. It’s a good way to stake high combination bets without taking much of a risk and you can’t do it anywhere else. It’s only available on German meetings, however. This is certainly a site built for efficiency and functionality as opposed to aesthetics or impressive design features; it hasn’t quite come to terms with what decade it exists in. Some aspects of it work extremely well in terms of usability and navigation while others need work. The drop-down menus aren’t the most helpful and feel out of date, but most of them aren’t directly linked to betting activity (offers, stats, editorial etc) so they only partially impact the experience. 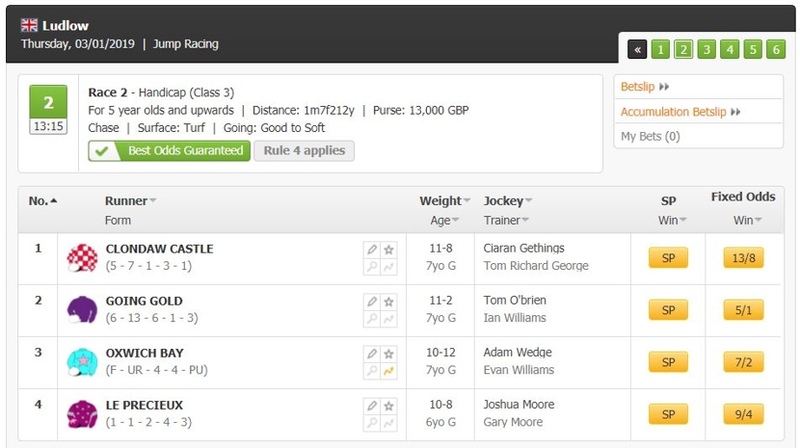 The race menu selection box, on the other hand, is particularly intuitive and effective, allowing punters to choose between ante-post and current races, then filter either gallop, jump, trot, or greyhounds before viewing races by country. 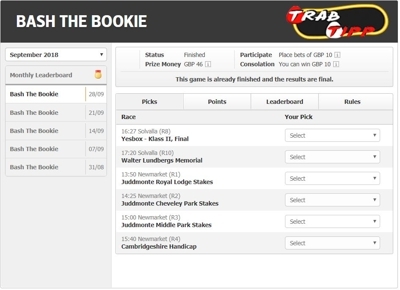 It’s an interactive tool as well, with buttons showing when a race is priced up and giving small links to available head to head and specials markets for each race. It can also be altered to a calendar view. You can do a lot with this tool and it doesn’t take much getting used to, there is even a 30 second ‘tour’ that explains how to use it. It’s when you get into the races themselves that things become less intuitive. The more you explore the more you realise how much depth there is to this site, and it can become quite overwhelming quite quickly. It isn’t that they haven’t thought around potential usability issues, it’s just that their solutions aren’t immediately obvious. It’s all give and take here, though, because for all the fiddling about there are some features that punters will love. Hovering over a horse, jockey, trainer etc will bring up a photo and useful information like winnings, places, breeder, owner etc. You can also make notes on each horse, favourite them, and explore past form. In summary then, the site is capable of a heck of a lot, performs brilliantly, and contains many truly useful features; but it’s a bit faffy and overwhelming in places and comes with a steepish learning curve. There is no way the desktop site could be adapted to the small screen in its current form, it’s just too detailed with too many options. 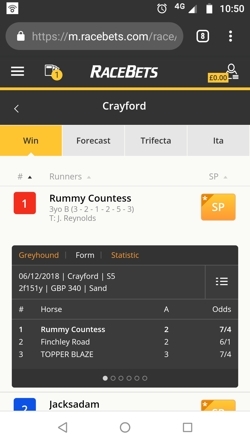 So what RaceBets have done is take the race menu selection box we mentioned earlier, and adapted that to become the entirety of the mobile site – and it’s brilliant. First of all, it operates smoothly and feels much more like a contemporary product in comparison to the desktop site, not to mention the fact that it looks nicer. The way it delivers betting options and information is incredibly well thought through, with each new choice coming at just the right time so as not to clog up the screen or cause confusion. For example, once you have chosen a country, meeting, and race, the runners will appear and you can cycle through available bets; Win, Forecast, Trifecta etc before going on to make the bet. What’s more, the stats for each runner are still available from an expandable (and otherwise invisible) info box and are just as comprehensive – you can see form for the last 12 months. It’s all lightning fast too so it isn’t a chore, there’s no backwards and forwards, it reacts instantly. The menu button floats in further options such as Highlights, Extra’s, Contact etc from one side; while the account button floats in another menu from the other side. Your bet slip is the only other ever-present button. You will lose one or two minor features on mobile, such as being able to make notes on each horse, but for most punters this is an ideal companion to the desktop site – you could even use it exclusively. 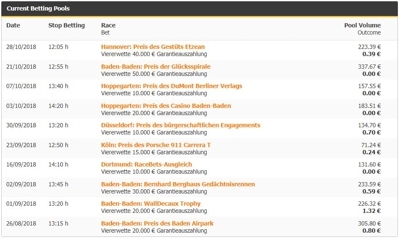 RaceBets was launched in 2005 in Germany with the aim of delivering the most comprehensive horse betting experience anywhere online. Only 2 years later they had become the biggest bookmaker in Germany. What’s that stereotype about German’s being efficient…? In 2010 two key changes occurred; the business relocated to Malta (we wonder why) and German Racing were invited to become major shareholders in the company, an offer which was accepted. The purpose behind this was to begin reinvesting some of the profits into the sport, thus keeping it alive and flourishing. By 2012, RaceBets could offer full coverage of all UK and Irish horse racing markets which propelled them forwards to become one of the most recognised names in global race betting, and things have been going well for them ever since. 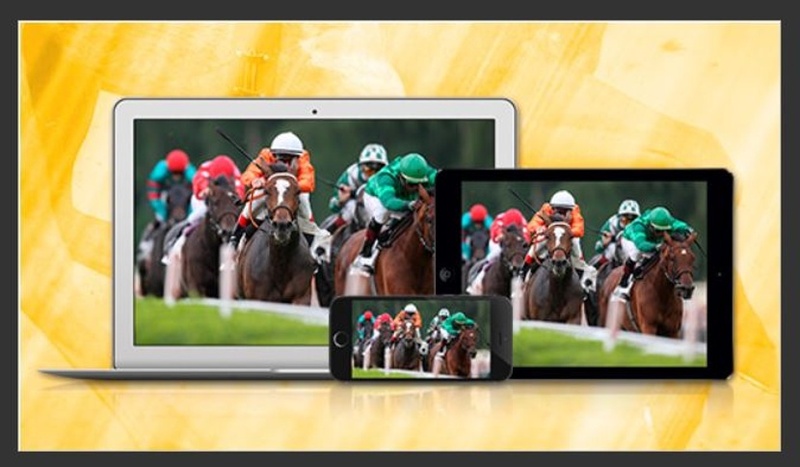 RaceBets now offer markets from 40 different countries and cover more than 250,000 races every year, hundreds of which are live streamed every day. Meanwhile, the company’s focus on customer service ensures that punters happily come back for more. This is an easy one: you should bet with Racebets if horse racing is your main interest. It’s an especially good option for those who might not be so experienced because although the platform is professional and ridiculously detailed, there is a lot of help available in the guides if things start becoming a bit bewildering. Every sportsbook offers horse racing, but RaceBets is a dedicated bookie that gives horses and greyhounds its full attention so you get more for your money here. All of the promotions and features, of which there are many, are aimed at racing bettors so you can find much more to take advantage of here than you might with a traditional sportsbook, as well as some exclusive features. Racebets are clearly a company that is happy to talk to its customers. Information on support is all over the site, and they have also created their Knowledge Base which is a bit more than just a fancy name for an FAQ. The Knowledge Base wraps up everything that punters might want to know in one place, including educational articles like betting rules, the different markets, and a beginner’s guide to betting; as well as more traditional FAQ fodder. It’s all sensibly categorised and the whole thing is searchable, too. Contact options don’t leave us wanting either. You can call, write, e-mail, or use live chat – there’s even a Twitter account if you want extra engagement. The instant help options are only available between 9am and 10.45pm, but since there aren’t many races outside of these times that shouldn’t be too much of an issue. 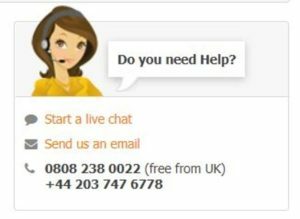 Live Chat – Easily accessible and live between 9am and 10.45pm. @RaceBetsCom – Here they promote their offers, release info and news, and highlight upcoming meetings.